Laie offers luxury and relaxation on Oahu's scenic northeast shore. This area is known for its balmy trade winds and abundant sunshine with easy access to some of Hawaii's finest beaches as well as many interesting things to see and do on Oahu's beautiful windward coast. Check out the local beach parks to enjoy the white sandy shores and clear blue water. Take a drive along the north shore to see the famed surfing beaches of Waimea Bay, Banzai Pipeline, Sunset Beach and Haleiwa. Golfers will enjoy two courses at the oceanfront Turtle Bay Resort as well as a seaside public course in Kahuku and three great courses on the eastern shore. 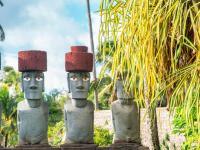 The Polynesian Cultural Center in Laie is one of Hawaii's top attractions with extensive hands-on cultural exhibits, elaborate theatrical performances and an IMAX theater. You will be engaged for hours as you visit the various villages representing Polynesian nations and learn about the Hawaii of ancient times. Laie is also the site of the world's fifth oldest Mormon temple as well as the Brigham Young University Hawaii campus. To enjoy the ocean check out Hukilau Beach or Laie Beach Park with nice views of the scenic islets offshore islets. During the summer months Hukilau Beach Park in Laie is great for swimming and water activities. However there can be strong ocean currents here during the winter months when it may be better to visit a lifeguarded beach if you want to go in the water. That's also true for Laie Beach Park which has a shallow sandbar that drops off quickly creating strong shore break during times of high surf. When the ocean is calmer Laie Bay is one of Oahu's nicest beaches for swimming, snorkeling and other water activities. Head down to Kaneohe Bay and Kailua Bay for relatively well-protected waters that are popular for a whole variety of ocean activities from kayaking and surfing to stand up paddle boarding and snorkeling. The Hukilau Cafe in Laie is a great place to refuel with a burger or steak for lunch, or grab a plate lunch and head for the beach. To eat like the locals try the teriyaki chicken or beef on hot steamed rice with a side of macaroni salad. You may recognize the Hukilau Cafe from its appearance in the Adam Sandler movie 50 First Dates. Visit the Laie Shopping Center for a variety of restaurants including fast food outlets. The Polynesian Cultural Center in Laie hosts an elaborate Hawaiian luau feast accompanied by an award-winning dinner show. For more dining options visit the windward towns of Kaneohe and Kailua where you will find dozens of great restaurants to choose from. The Laie Shopping Center has a grocery store, move theater and a variety of shops to browse. For more great shopping head south to the towns of Kaneohe and Kailua. The windward mall in Kaneohe has more than 100 merchants along with a movie theater. Browse the art galleries and boutique gift shops in Kailua town, where you will also find department stores and pharmacies. A rental car is recommended when staying in Laie vacation rentals so you can explore the many great north and east shore beaches and attractions as well as day trips to Waikiki and downtown Honolulu. Laie is located 38 miles north of Honolulu. Most major populated areas of Oahu can also be reached on the public transit system known as "TheBus." Laie weather ranges from about 70 to 85 degrees F. throughout the year with rain and wind conditions varying in different areas throughout the Island. The eastern and northern shores are generally a bit wetter and cooler than the south and west shores, and the winter months typically see more rain than summer. 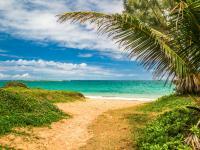 Sunny skies, mild temperatures and warm trade winds make Laie an excellent vacation destination all through the year. Rain showers are typically brief and light with ample sunshine even on the rainier days. Hawaii's predominant trade winds blow from the northeast bringing moisture-laden clouds that typically rain onto the mountains of the east and north shores creating green and lush landscapes.Trade winds are almost always calmest in the mornings so it's a good time to visit the beach. Ocean conditions vary each day though typically the north shore will have the calmest waters during the summer months and the south shore will have the calmest waters during the winter. Some beaches provide more protection from the open ocean, and if the waves are too big at the beach you visit then you may be able to find a more sheltered beach where water activities are safe. For swimming and ocean activities visit Oahu's lifeguarded beaches, obey all posted warnings and ask about the conditions on that day for the activities you choose. Laie vacation homes provide the optimal way to enjoy your Hawaii vacation with all the luxuries of resort living and all the comforts of home. Browse through our Laie vacation rental listings to get an understanding of the different amenities and property features we offer. 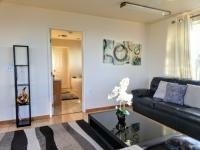 Our goal is to provide you with a with an unforgettable Laie accommodation for your dream Hawaii vacation. We take pride in having the largest selection of high-quality vacation rentals on Oahu and we stand behind our product, making sure only the best of the best Laie properties are listed on our site. If you have questions about our Laie rentals or which Oahu destination is best for your vacation needs, please give us a call and we will be happy to assist you. In 1850, ten Mormon missionaries came to Hawaii, then known as the Sandwich Islands, and established a congregation of the Church of Jesus Christ of Latter-day Saints (LDS Church). The sixth president of the LDS Church, Joseph F. Smith, announced plans to build a Mormon temple in Laie temple in 1915, and it was dedicated in 1919. This was the first Mormon temple built outside of the continental United States and guide books at the time compared it to the Taj Mahal. Today the temple's Visitor Center attracts about 100,000 people each year.